We accept American Express, Discover, MasterCard, Visa, Credit, and Debit Cards,or an electronic check from your checking account. Your Internet Handling fees for any shopping cart total are as follows: electronic checks $4.00, Credit / Debit the greater of 2.5%. 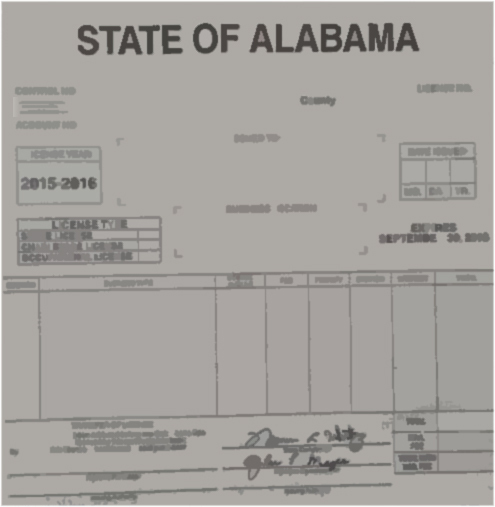 The internet handling fee is not paid to the County but to IMS Enterprises, Inc. an Alabama company. The Alabama Mandatory Liability Insurance (MLI) Law provides that no person shall operate, register, or maintain registration of a motor vehicle designed to be used on a public road or highway unless it is covered by a liability insurance policy. Beginning January 1, 2013, license plate issuing officials will attempt to verify liability insurance utilizing the State of Alabama Online Insurance Verification System, which will allow license plate issuing officials to immediately verify the insurance status of a vehicle at any point in time. If insurance cannot be verified through the Online Insurance Verification System, vehicle owners must provide evidence of insurance to the license plate issuing official. The insurance card is the most common evidence of current insurance. To be acceptable, the proof of insurance must display the current effective date, insurer's NAIC number, vehicle identification number (VIN) and policy number. In addition to providing evidence of insurance, a valid state issued driver license, non-driver identification card, or national driver license must be provided for each owner reflected on the vehicle title. If the vehicle owner is a company, the federal employer identification number (FEIN) is required. Starting January 1st 2017 anyone that has obtained a handicapped registration placard or license plate must recertify. Your handicapped certification letter will be valid for five years with an expiration year of 2022. You will recieve a new certification letter in the mail, if you have been deemed permanently disabled by your physician, please self certify by signing your signature to the letter enclosed with your renewal as well as completing the top portion. If you are considered temporarily disabled by your physician you will need to have a new form on file.